IAM District 751 retiree Ron McGaha, left, raps about saving Social Security in a 2011 video entitled “Scrap the Cap.” In an ironic twist of events, by popular vote the pro-Social Security video recently won an anti-Social Security video contest sponsored by conservative billionaire Peter G. Peterson. The IAM salutes District 751 retiree Ron McGaha, the Washington State and Puget Sound Chapters of the Alliance for Retired Americans, and the Social Security Works coalition for winning a right-wing video contest intended on dismantling Social Security. The contest sponsored by conservative billionaire Peter G. Peterson and his foundation asked folks to submit videos on why it is important to “fix” the national debt of which, he and his foundation claim, Social Security is a major contributor. The winner of the $500 grand prize was to be determined by popular vote. 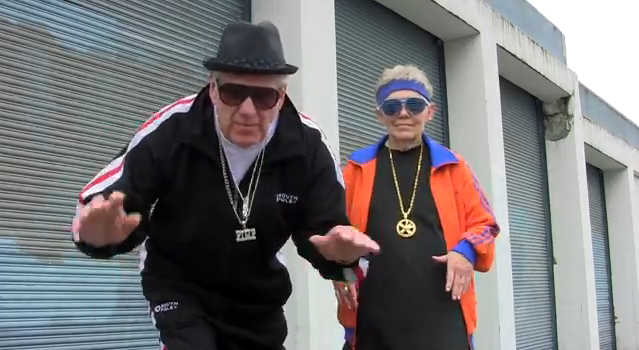 Social Security Works entered into the contest a 2011 video featuring McGaha and other retirees donning sunglasses and rapping about the only way to shore up Social Security’s long-term finances is by scrapping the payroll tax cap, not through cuts or privatization. That means billionaires like Peterson and rich CEOs would pay the same Social Security tax that low- to upper-middle-income workers do. Currently, any income above the $113,700 cap is exempt from the Social Security tax. In what could only be described as sweet irony, McGaha’s pro-Social Security “Scrap the Cap” video won the Peterson Foundation’s anti-Social Security video contest.